I haven’t blogged since May and it’s now September, and where, exactly, did the summer disappear to? Mind you, if you do follow my blog you already know my output is sporadic at best! Contrary to my lack of activity on my blog, it has been a busy time for me, so here is a whiz through my summer. I’m delighted to say I signed another two book contract with Harlequin Mills & Boon at the end of April, plus a contract for a Regency novella which will be released for Christmas 2017. The deadlines for the 2 books were 31st August 2016 and 31st January 2017 – which seemed doable as I had already prepared outlines (unusual for me) – until I realised the deadline for the novella was 14th February 2017, just 2 weeks after the deadline for book #7! So I have had my head down since then, writing book #6 (provisionally titled Duke in Disguise). It was hard going for a while and more than once I feared I would never make the deadline, which happened to be just two days before my husband and I set off on holiday, leaving me no room to manoeuvre. But I made it. Phew. Now my nerves are being soundly wracked as I await my editor’s verdict. In the spring I was interviewed on our local BBC radio station as part of their community takeover event. I met Maggie, the interviewer, through a talk I gave to a writing group at my local library, and she asked if I would be willing to be interviewed by her on the radio. It took place at her house rather than at the radio station, which would have been more intimidating, and after our initial bout of ‘um’s and ‘er’s we managed just fine. You can listen to me bumbling away here, if you so wish. 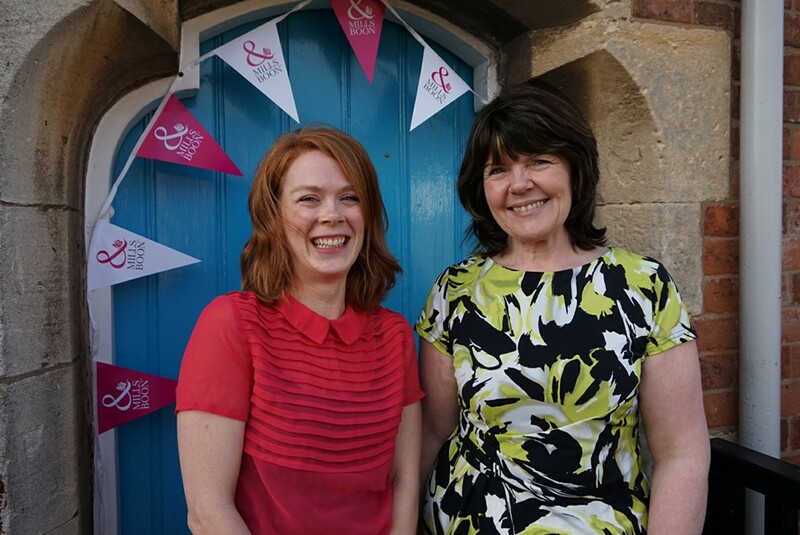 In June I took part in a Love at the Library event at Harbury Library, with Ellie Darkins, who writes for the Mills & Boon Cherish line. We both thoroughly enjoyed ourselves despite our nerves beforehand. We spoke about the history of Mills & Boon and how we came to be writing for them (I’ve blogged about my journey before – you can read about it here) and then we held a Q&A session. The audience were lovely! 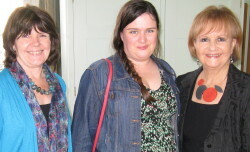 Then in July I sat on a panel at the inaugural Evesham Festival of Words with fellow local authors Alison May and Lindsay Stanberry-Flynn. Our event was ‘Inside the minds of three authors’ and, after each reading an excerpt from our work, we discussed why we write what we write and our different approaches to writing. Again, the audience were fabulous which helped to settle my nerves. I found with all three events that my nerves vanished as soon as I got going, and I realised the same thing happens with many of life’s challenges – perhaps it is the surge of adrenalin as I swing into action ;-). Yesterday was another first. I gave a talk at my local library—my first talk as a published author. I wasn’t sure what to expect. I knew the ‘audience’ (it seems a rather grand title for a small event) was the relatively newly-formed creative writing group, and I also knew that my library had informed a couple more local libraries of the talk in case their creative writing groups or book groups might like to come along. I originally intended to publicise the talk on Facebook, through my membership of a couple of local Facebook groups but, in the end, decided against it as it was my first time. When I first agreed to do the talk I was a touch blasé. It’ll be fine, thought I. It was only the day before that the knot of nerves in my stomach threatened to overwhelm me and, by the time I arrived at the library (on high heels that already pinched as I hobbled up the stairs), I was deeply regretting my initial bravado. I felt unprepared and the old adage ‘Fail to prepare and prepare to fail’ kept buzzing around my head. As it happened, it was great. It was informal—we all sat around a large table (thank God. Remember those heels! )—and it felt more like a chat than a talk, albeit with me doing most of the chatting. There were 7 people there, including my friend, Morton Gray, who came with me as chief cheerleader. I talked about how I came to be published: from my ambition as an 8 year old to be an author, to the way ‘real life’ gets in the way, to the moment I got ‘The Call’. I had written a few prompts, mainly to keep my timeline straight (sounds like writing a novel, doesn’t it?). Also, knowing that one of the questions I am asked most frequently is ‘How long does it take you to write a book’ (to which I normally mumble and fudge my way around the answer), I set out to find out how long it does actually take me. Answer? I don’t know. The three books I have completed so far have been started and stopped and interrupted by Nanowrimo (http://nanowrimo.org/ ) and editing demands of the previous books and real life too many times to count. I even created an Excel sheet to try and reach an answer (now that’s a grand way to procrastinate!) but I am still no wiser. As it happens, nobody did ask that question which is just as well. We had a lovely Q&A session at the end, finding out what everyone was writing and whether publication was the ultimate aim and, afterwards, one of the ladies attending asked me if I would be interested in giving a talk to a local Townswomen’s Guild. Of course, I said ‘yes’, particularly on being told they have a budget for speakers ;-). Afterwards, I treated Morton to a cappuccino and we reminisced about how far we have come since we first met 3 years ago at our local RNA chapter lunch. The questions asked after my talk were the same questions we were asking back then. Now, we are supplying the answers. Have you had any experience of speaking in public and do you have any top tips for people, like me, who are just getting started?